VMware worked out a great way to migrate users running vCenter server application on Windows based system into a Linux appliance. This Linux appliance is based on Photon OS, a VMware Linux distribution, optimized for vCenter server application. It provides a hardened security with security patches released fast when a vulnerability is discovered. 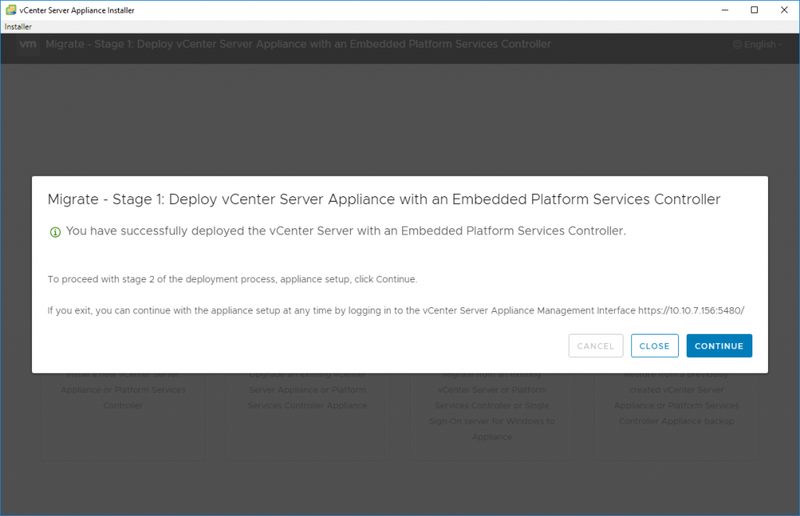 Previously, VMware vCenter server Appliance (VCSA) was based on SUSE Linux Enterprise Server (SLES) where the security patches were released when SUSE released them. 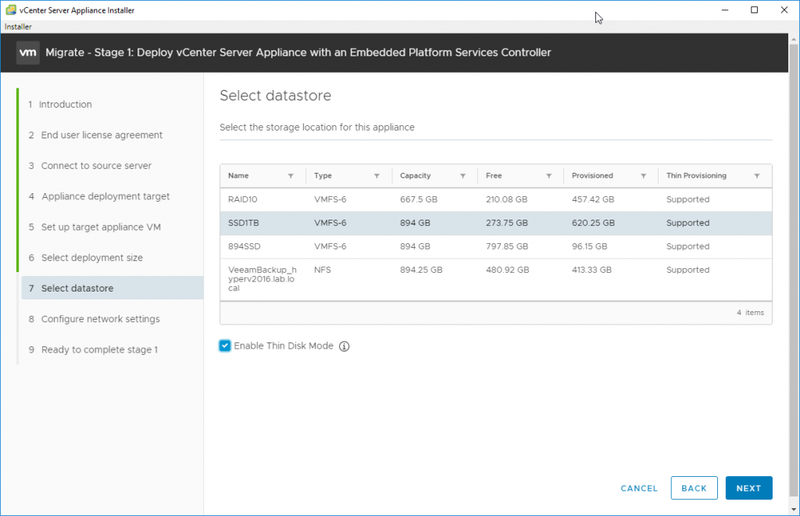 So now when VMware owns the full stack, the VCSA has not only all the features that the Windows based vCenter server has, but even more. 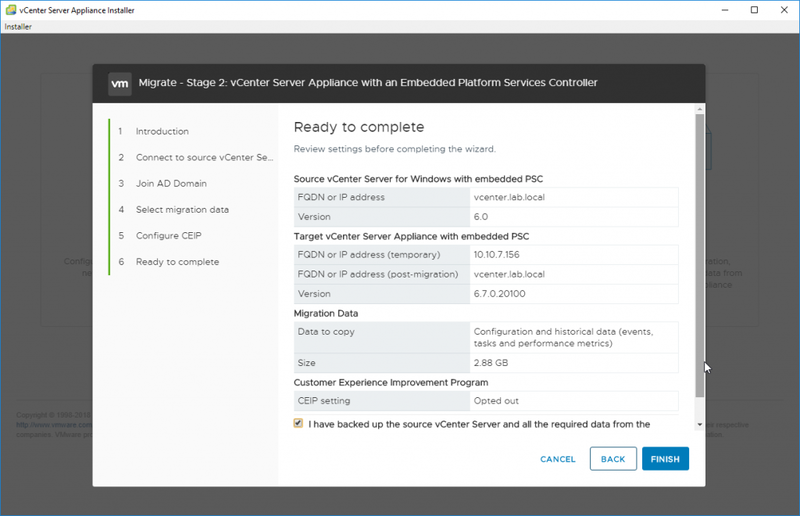 Today we will demonstrate a migration of Windows based vCenter server to VMware VCSA. The migration is semi-automatic, where you need to perform some manual tasks and follow assistants. However, the migration is very smooth and very straightforward thanks to those assistants. 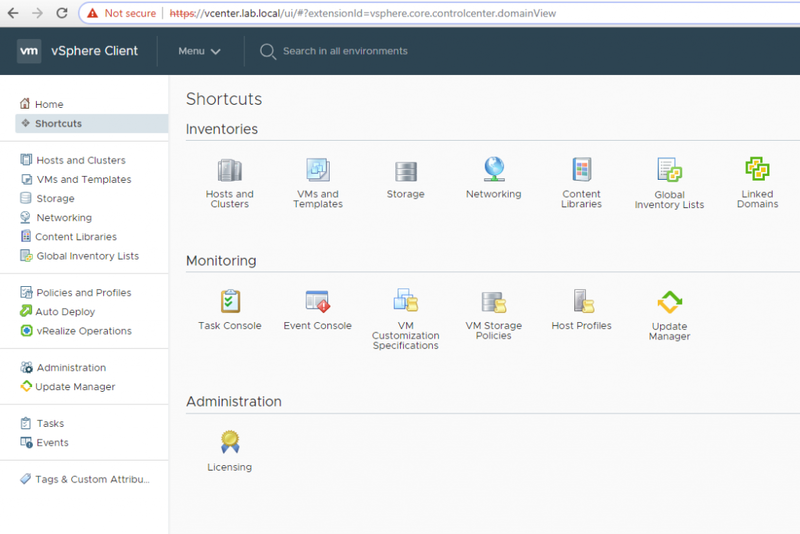 You don’t need to have any Linux skills in order to migrate your vCenter server into VCSA. Some guidelines, however, shall be respected. For example, you should make a full backup of your existing vCenter server. In case something goes wrong, you can always revert back to your existing environment. 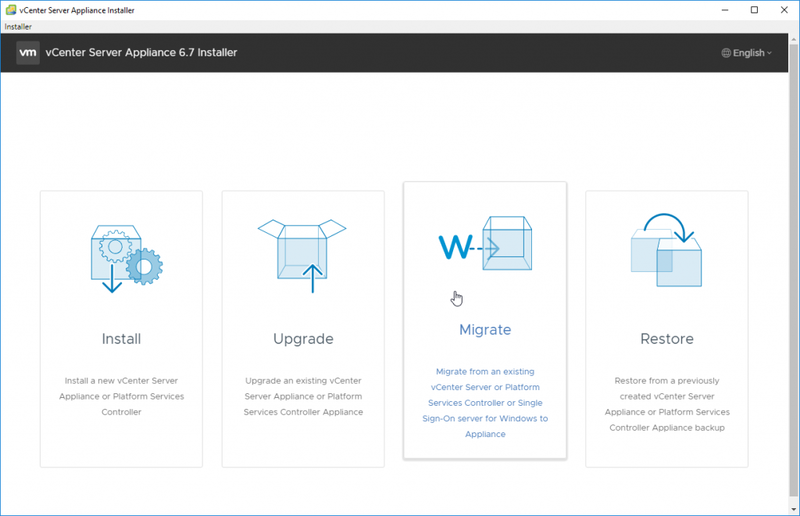 You can migrate from vCenter server 6.0 or 6.5 into the VCSA 6.7 U1. 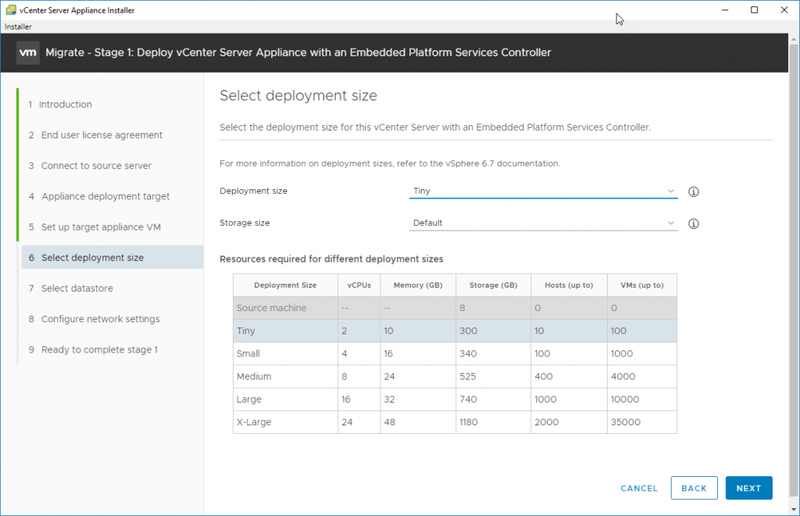 You can also have external Platform service controllers (PSC), where v6.0 and 6.5 are supported. In this post we will use a graphical user interface (GUI) method for the migration process. However, you might also be interested in CLI method which uses JSON template. 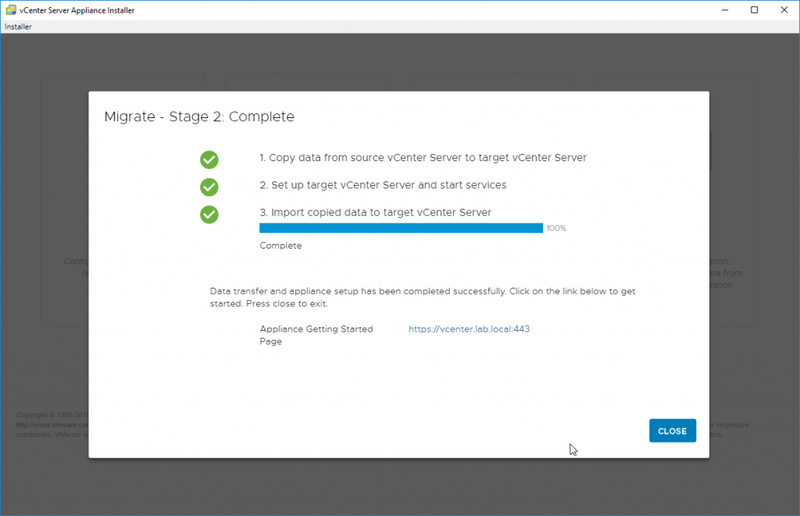 Source and target systems must meet specific software and hardware requirements before you can migrate a vCenter Server, vCenter Single Sign-On, or Platform Services Controller deployment to a vCenter Server Appliance or Platform Services Controller appliance. Clock synchronization of the target machines on the vSphere network before migration starts. If you’re using Fully qualified domain name (FQDN) make sure that the management workstation you’re using to launch and monitor the migration process, and the destination ESXi or vCenter, are on the same DNS server. 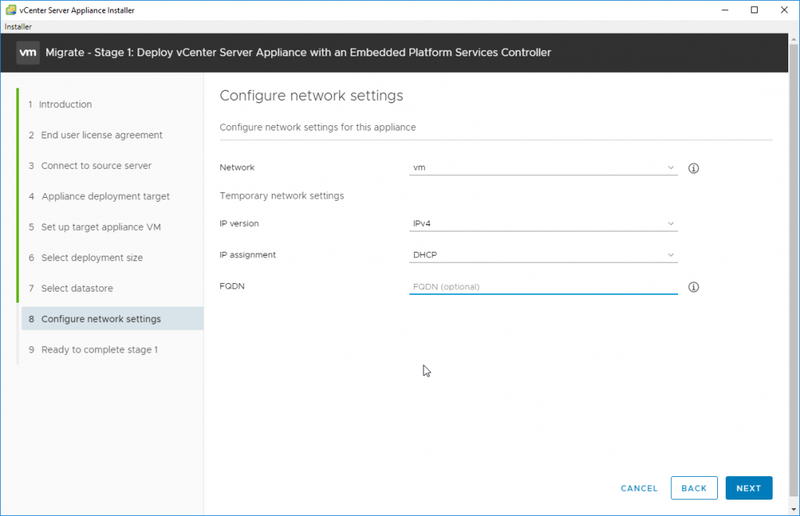 Source vCenter server (and PSC, if separated) are not using DHCP. Let’s get started with the migration. 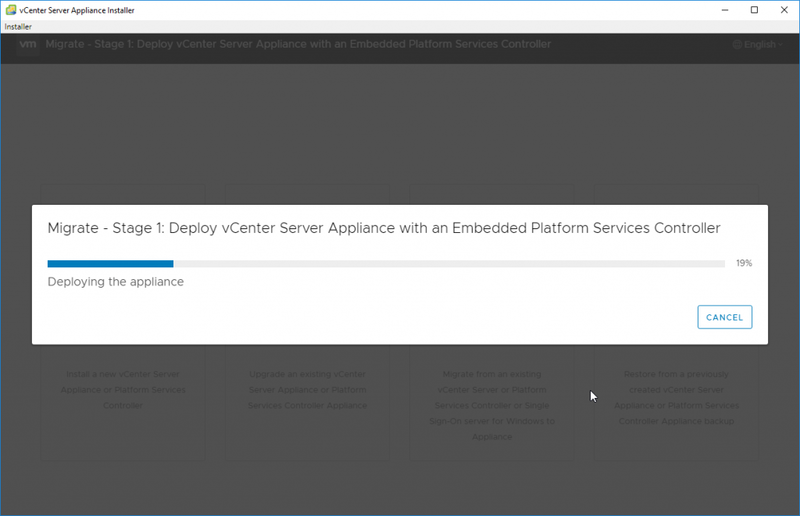 At first, connect to your vCenter server on Windows with elevated privileges. Mount the latest VCSA ISO > Go to a subfolder on the root called Migration-assistant > Execute the VMware-Migration-Assistant.exe. You’ll need to provide an administrator@vsphere.local (or whatever name you had setup for SSO domain). The assistant will do several checks of the whole environment before showing a message “Waiting for migration to start”. So after seeing the “Waiting for migration to start” you can leave the Windows VM as is and go to your management workstation. The management workstation can run Windows, Linux or MacOS as system. Both 3 are supported for launching the migration from. In our case we’ll be using Windows machine. Mount the VCSA ISO and launch the installer.exe file which you can find in the “vcsa-ui-installer” folder where there is a subfolder called win32. As being said, if you’re using Linux or Mac, you’ll to choose either “lin64” or “mac” as a folder and look for the installer there. Launch the “install.exe” and click the large “Migrate” button to start a new assistant. Accept the End user licensing agreement (EULA) and enter the source server. Example from the lab is below. 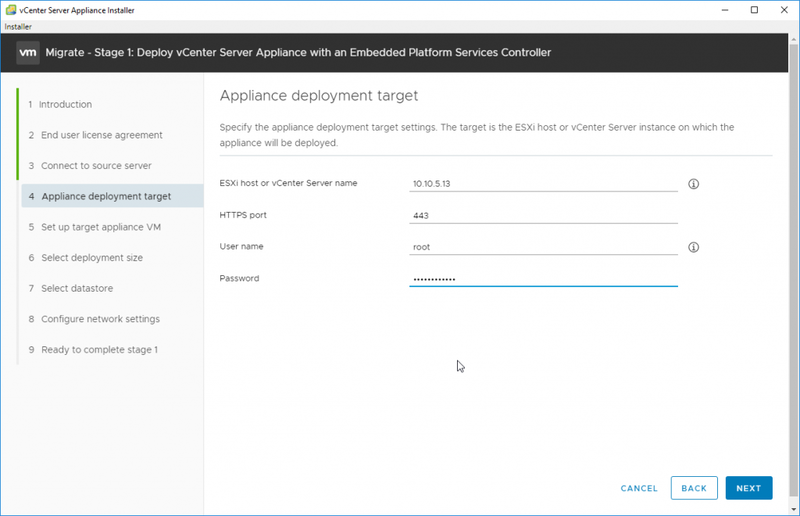 Then after clicking Next, enter the ESXi host or vCEnter server. This is the destination where you’ll be deploying the new VCSA appliance. After clicking Next, specify the VM name and set a root password. Don’t forget the root password as this password is used for when you connecting directly to the VCSA appliance, and it is used for monitoring or patching and (or) upgrades. On the next page, we’ll have to choose the size of our environment. VMware covers all environments, you can use the drop-down menu to pick the one which fits your environment. After, on the next page, you’ll need to pick storage where the VM will be created and stored. You have a possibility to use thin disks to save disk space. On the next screen, choose network settings. Note that those settings are not the final settings as the final network settings will be copied from the original vCenter server. Like this, the migration will be completely transparent to the network and no other reconfiguration of your satellite products are necessary. (this can be backup/monitoring software etc). The first phase will start where a new clean VCSA is deployed and started. After the first phase is done, the second phase will copy over all the necessary data from your old vCenter server. 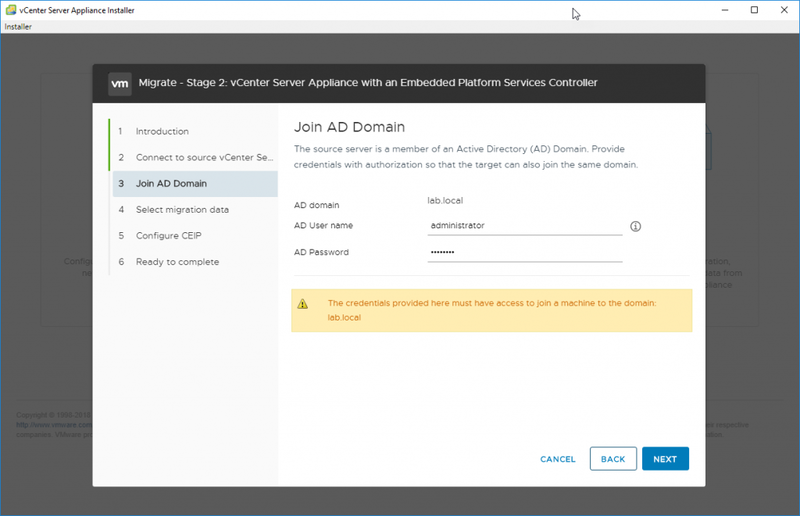 If your vCenter on windows is part of Microsoft Active Directory, you’ll have to specify your Microsoft Active Directory (AD) domain, administrator user name and password. And you can also select what you want to copy to the VCSA. There might be an old data you do not want to copy or you do not care to copy. It will also speed up the migration process. The final recapitulation screen shows all the parameters we have just entered. 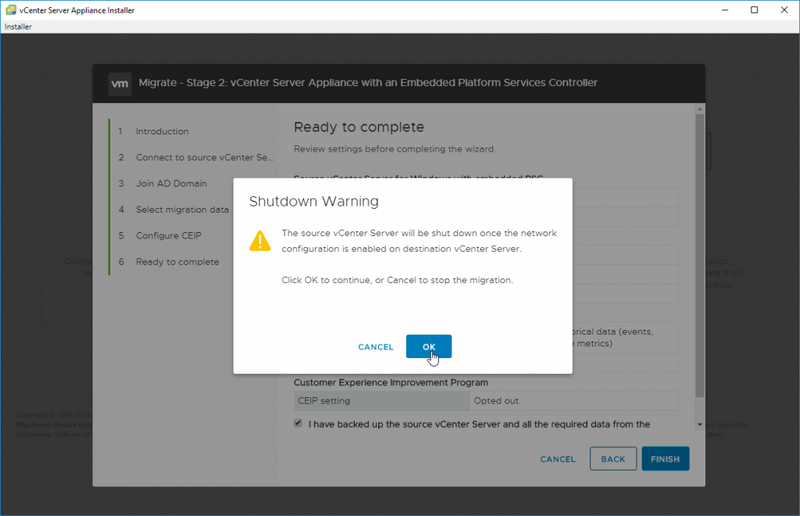 You’ll receive a warning that the original vCenter server will be shut down after the copy is finished. In case you cannot migrate during business hours, this allows you to prepare those steps ahead, and do the final step when you have time. 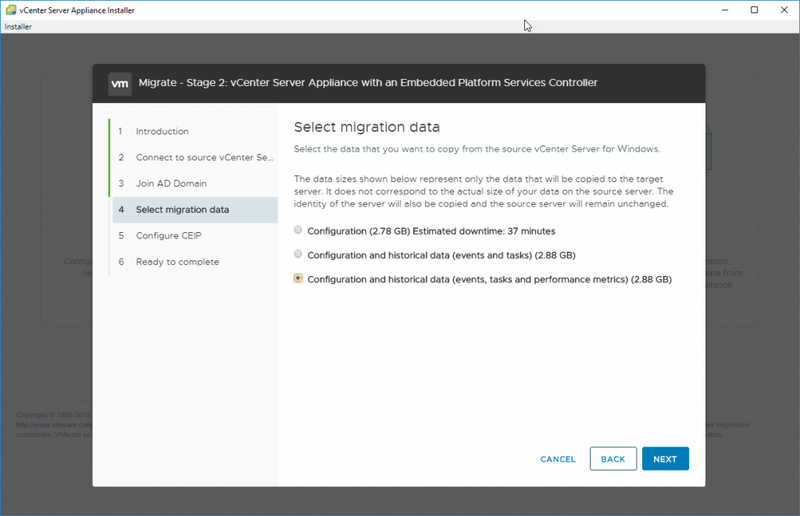 If you click OK, you can also have a look at the Windows vCenter server VM where in the background, you’ll see some copy operations going along other migrations steps. And the final screen should show no errors, and successful migration. 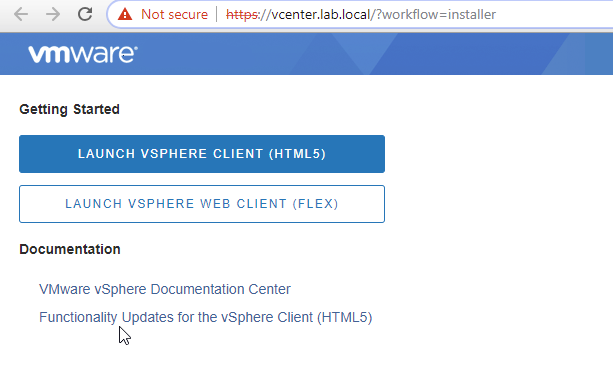 After clicking Close button, you’re automatically redirected the connection page where you (still) can connect via the vSphere Web client (Flex) or chose the new and modern HTML 5 web based client. And you’re now connected to VCSA, where vCenter has nice web-based user interface. 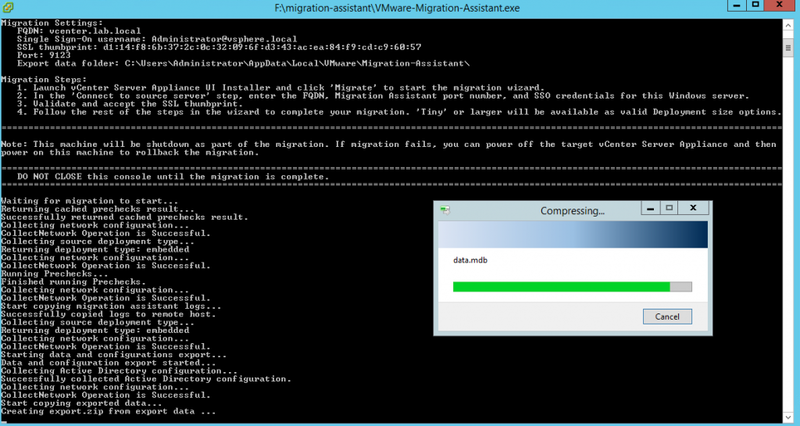 VMware has done a good job by creating this migration assistant with its workload. 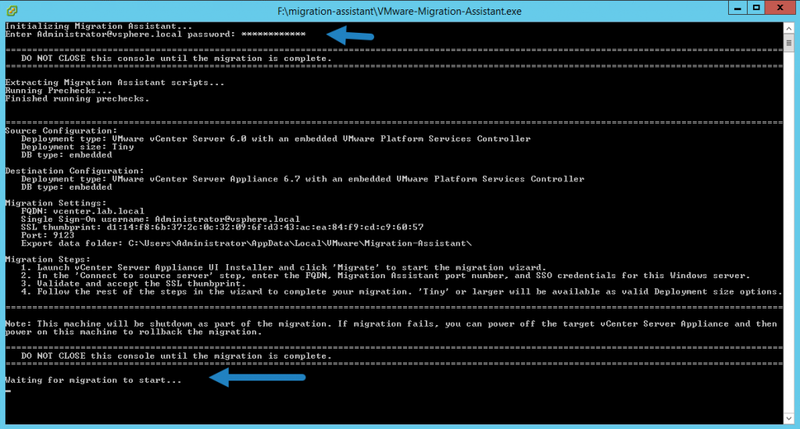 It really simplifies the migration to VCSA. 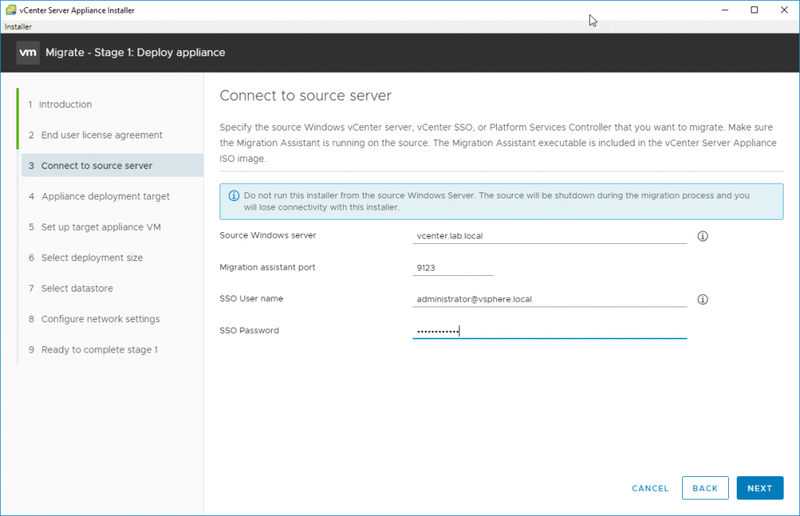 If you’re still running your vCenter server on Windows, you do not have to worry about the migration. It is pretty easy. You should know that the next big release of VMware vSphere will not be available on Windows any longer. 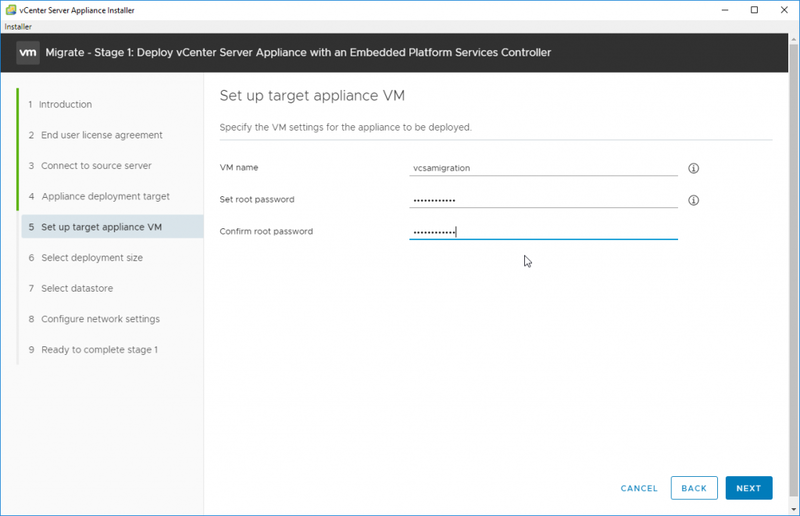 VMware is clearly stepping out of the dependency on Windows and privileges the VCSA. While in the past, the VCSA did not have features parity, the VCSA 6.7 U1 has even more features than Windows based vCenter server.